Media vs. Marketing: What is the difference between advertising and sponsorships on political blogs anyway? | News and Features | Style Weekly - Richmond, VA local news, arts, and events. Media vs. Marketing: What is the difference between advertising and sponsorships on political blogs anyway? This screen shot is of a front page from the Republican Standard blog edited by Shaun Kenney, a former executive director of the Virginia GOP. 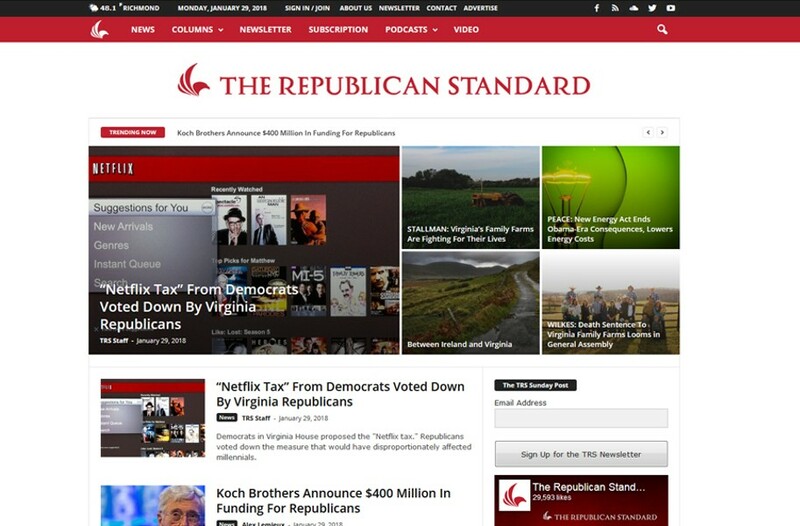 Last summer, just as state and local election campaigns were gearing up, a crisp-looking new blog and website showed up called the Republican Standard. It pitched itself as a "new media journal delivering clear, factual and smartly-balanced information to Virginia's public square." What the site doesn't say is that it received $2,500 in a sponsorship from the election campaign of Republican Ed Gillespie, who ran unsuccessfully for governor, according to the Virginia Public Access Project, which collects information about political spending from the Virginia Department of Elections. And it got another $5,000 in a sponsorship from the Colonial Leadership Trust, a political action committee begun last year by now Speaker of the House Kirk Cox, who was running for re-election. Gillespie's campaign also bought $2,500 in advertising, according to the access project. Most news comsumers are accustomed to seeing advertising. But it's typically marked as such, or clearly delineated from editorial content. What's unclear are sponsorships. How do they differ from ads? And should the latter be clearly identified on a social media outlet? The answers are important as political websites mature and viewers need to assess their veracity. The election department rules do not define the difference between advertising and sponsorships, so it's left up to campaign staff to define. The site was registered on May 31 as the Republican Standard, whose agent is Raymond Fulton Allen Jr., State Corporation Commission records show. Allen's downtown Richmond office also houses Creative Direct, a political marketing company with ties to Republican candidates. Its editor is Shaun Kenney, a former executive director of the Virginia Republican Party and an influential conservative who blogs on several websites throughout the state. Joshua Huffman, a conservative blogger and a graduate student at West Virginia University, is critical of the site's coverage, saying it is unbalanced, and because it doesn't disclose its financial ties to political campaigns. "Once I found out that the content was being paid for and there was no disclaimer, I have to say it rubbed me very much the wrong way," he says. Huffman published blog items criticizing the website on his outlet the Virginia Conservative. He shared his piece with the Bull Elephant, a conservative website based in Northern Virginia. He was specifically critical of what he says were postings questioning polls showing that Gillespie was behind in last year's race. Gillespie's opponent, Ralph Northam, won the race with 54 percent of the vote against Gillespie's 45 percent. The site received $5,000 for a "sponsorship" on July 21 from the Colonial Leadership Trust political action committee, records show. It was begun by Cox last year "to advance conservative ideas and policies in the Commonwealth, defend the 66-seat GOP majority in 2017 and beyond, and promote the record and agenda of Republicans in the Virginia House of Delegates," according to its website. Major contributors to the PAC are utility Dominion Energy, tobacco giant Altria and law firm McGuire Woods, according to VPAP data. Allen says that he's unsure what the distinction is between a sponsorship and advertising, which he says he gladly accepts on the site. "If you looked at our site during the campaign, we had lots of ads for Gillespie. I don't know what 'sponsorship' means. We sell ads," he says. Regarding Huffman's criticism of its content, Allen says "he's entitled to his opinion." Allen is proud of the site, he says, which quickly received nearly 30,000 online likes on Facebook. Parker Slaybaugh, a spokesman for Cox, likewise says that the funds the political action committee gave to the site were advertising. "They're all the same thing," he says, noting that neither the Gillespie campaign nor Cox's PAC "funded" the site. Kenney and Gillespie did not respond to Style's requests for comment. As for the differences between advertising and sponsorship, Jignesh Gavale of ZS Associates, an Evanston, Illinois, consulting company, wrote on a blog that advertising tends to be a "single" message or a campaign. Sponsorship is typically "a stronger and more ongoing commitment between the sponsor and the program or event provider." Norman Leahy, a conservative blogger, sees nothing wrong with Republican Standard, which he describes as "the latest iteration in blogging — more business oriented, better looking, and also much more partisan. "That's a long way from where the Virginia blogosphere started in 2004 and 2005, when most site operators were dedicated hobbyists working on buggy platforms that looked horrible," he adds. As for running advisories on whether they get sponsorships, some bloggers do and some don't. Lowell Feld, publisher of the left-leaning Blue Virginia website, declines to comment on the Republican Standard situation. Asked if he gets sponsorships, he replies that his site runs paid advertising, notably from Democratic politicians, and accepts donations from individuals. The libertarian-leaning Bacon's Rebellion blog has had paying sponsorships from higher education and smart-growth groups. It also has a controversial sponsorship from Dominion Energy, known for its generous political campaign contributions. The site has a logo on its home page acknowledging the Dominion sponsorship. "I think that's an important disclosure to have," Huffman says. Leahy says that sites can have slants and that the name Republican Standard is an obvious example. As for funding, "if the RS has deep pocketed backers, that's not a big deal to me. Backers pay the bills, be it for web hosting, equipment, or that most precious commodity of all, a writer's time," he says. Editor's note: Galuszka was a regular contributor to Bacon's Rebellion and now blogs at The Washington Post's All Opinions Are Local site.